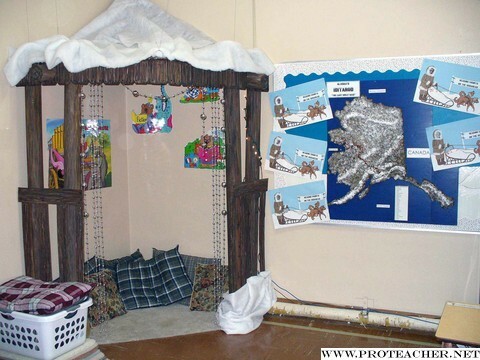 Our Reading Corner is a structure that lends itself to various themes. It is made of recyclables for the most part. The only costs are for paint, florist wire, a couple yards of burlap, aluminum foil tape ( found in the hardware dept.) & looseleaf rings. Pillows are an additional cost but optional. The roof is made from cardboard boxes discarded by an appliance store. They are taped together to give the needed width. The posts are cardboard tubes discarded by a carpeting store. The tubes are set in 3 lb. coffee cans which are then filled with pea gravel. This includes the inside of the tube in the can. Burlap covers the pea gravel filled can. The roof is suspended from the ceiling grids with florist wire and looseleaf rings. The posts then are put through holes in the cardboard roof to keep them from tipping over. The posts can be removed and stored intact as they are every summer, so maintenance can clean & wax the floor in our room. The roof remains as it is, above head level and out of the way. The structure this year is a cabin because our school's reading theme is The Iditaread. When school began, the cabin was decorated with garlands of autumn leaves. The leaves were removed and it became covered with "snow" when the seasons changed. The cabin railings and overhang are painted appliance cardboard which is wired to the poles. The structure is in its fifth year of use and still in good condition. In the past, it has had life as an island hut with a grass mat covered roof. Flowers, vines & fish nets covered the poles and roof edges. The structure has also been a castle, an adobe and a pagoda. All theme pieces are appliance cardboard that lie flat against a wall in the storage closet. A carpet remnant covers the floor. A string of Christmas lights add extra light on gloomy days. To extend the area, carpet squares and pillows are kept in a laundry basket close by. The reading corner holds 3 or 4 students comfortably. Our classroom is a 3rd grade special ed room. The reading corner is a great place to take a book. The cozy corner seems to have a calming effect on the students. We rarely have a discipline problem inside of it.